When plugged into shore power at the campground, presumably the AC to DC converter will charge the auxiliary battery bank. All the lamps, fans, water pump, etc., still operate on 12-volts DC, just that the DC electricity is provided by the converter instead of the batteries while plugged in. If the converter charging module (or the breaker for the converter), is turned off, or if you have some type of battery disconnect solenoid engaged, the batteries will not be able to receive a charge. Your microwave, by the way, is powered by 120-volts AC only; which is why the clock still works. The fact that the lights got brighter when you started the engine is an indication that the batteries are indeed very low, if not completely dead. The engine alternator was simply providing the DC voltage while the engine was running. 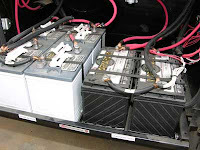 Regardless of the brand of motorhome, the brand and type of converter/charger installed and whether or not any disconnect devices are employed, it’s obvious the batteries are not receiving a charge while the coach is plugged in to shore power. If you can measure an increase in DC voltage at the battery bank when the coach is plugged in, then the battery charge circuit is at least complete and probably working. If the voltage does not go up when plugged in, look for a blown fuse in the charge circuit in the converter/charger. 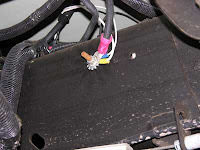 Look also for any electronic disconnect switches that totally isolate the battery system. It’s common on some coaches to employ these during storage or a lengthy downtime. If they are activated while using the coach, it literally takes the batteries out of the system, meaning you cannot charge or discharge them. Another cause would be an open conductor (broken wire) between the converter and the battery bank. Any type of break in that circuit would result in the same symptom. A high degree of oxidation or corrosion on the battery posts (both positive and negative posts), can also prohibit the batteries from being charged. Be sure the battery terminals are clean, dry and tight and check the ground connection at the frame from the negative terminal on the battery bank. Any open in the charging circuit could prohibit the converter from charging the bank. The last item to have tested, are the batteries themselves. A carbon-pile load test will determine the health of the batteries if everything else checks out.